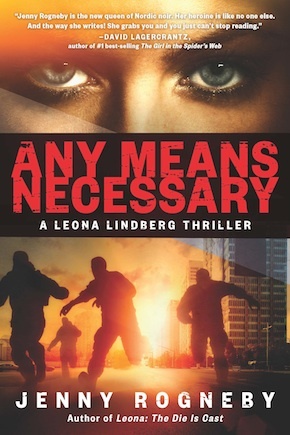 Any Means Necessary is the second book in Jenny Rogneby’s bestselling series of novels featuring rule-bending police detective Leona Lindberg. Keeping one foot on each side of the law, Leona mounts a special operation of colossal proportions that could reap high rewards personally as well as professionally. Here’s a glimpse into Jenny’s globetrotting writing routine. In Spain. I’m Swedish but I live in Malta, and I also have an apartment in Barcelona. Everywhere in the world. I travel a lot. One of the best things about being an author is that I can bring my job everywhere. This last two months I’ve been writing from Guatemala, Honduras, El Salvador, Nicaragua, Costa Rica, Panama, Sweden, Malta and Spain. I try to stay out of rituals, but I surf the internet for an hour, make a cup of coffee or tea, and then I start. Full-time. Four years ago I quit my day job as a criminal investigator for the Swedish Police. Since then I’ve released four books, so yeah, definitely full-time. I don’t. When I’m writing I’m thinking – probably too much. The corrupt police detective Leona Lindberg investigates a case where a suicide bomber blows himself up in front of Parliament House in Stockholm. I write what comes to my mind, things I find interesting, important, and stories that I feel that I need to tell. I don’t really think much about who’s reading, but I’m very glad that so many have the same interests as me and follow my series. My boyfriend, my publisher and one of my former police colleagues. No one. I’m fascinated and inspired by many fictional characters, but I honestly don’t go around wishing I’d created other authors’ work. – Atticus Finch in To Kill a Mockingbird by Harper Lee. The one I just started writing. My cellphone, eyedrops for dry eyes, some coins, Rum Punch by Leonard Elmore, A Judgement in Stone by Ruth Rendell, and two of my Swedish author colleagues’ books that I haven’t had the time to read yet. Oh, so many. Before I started writing I had mostly read science and biographies. I have a lot of fiction to catch up on. Books that make me think in a different way and see things from another perspective. 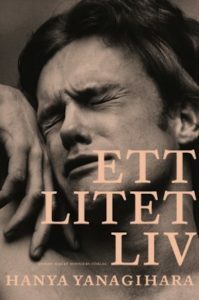 The Swedish edition of A Little Life by Hanya Yanagihara, translated by Niclas Nilsson. The Millennium series by Stieg Larsson and David Lagercrantz. A Judgement in Stone by Ruth Rendell. I’ve just started to write the fifth book in the Leona series. My father. He passed away when I was 17, and never got to know I became an author. I would love to discuss literature with him. … travelling. Or if I wasn’t an author I’d be investigating crimes. Jenny Rogneby was born in Ethiopia, but was given away for adoption when she was one year old. She grew up in northern Sweden, studied criminology at Stockholm University, and became an investigator in the Stockholm City Police Department. Her work inspired her to write the bestselling crime novel Leona: The Die is Cast, the first in the Leona series. Before her career in law enforcement, Rogneby was a singer and member of the pop group Cosmo4. Any Means Necessary, translated by Agnes Broomé, is published by Other Press in trade paperback and eBook. Agnes Broomé is Preceptor in Scandinavian Languages in the Faculty of Arts & Sciences at Harvard. Her other recent translations include Joakim Palmkvist’s The Dark Heart: A True Story of Greed, Murder, and an Unlikely Investigator (Amazon Crossing, 2018) and August Strindberg’s One-Act Plays (Norvik Press, 2012).